Are you trying to watch your weight? If you are, then you know how hard it can be to find a program that is supportive, helpful, and effective. You also know how difficult it can be to make healthy eating choices when you’re out, and restaurants and fast food chains are more interested in sucking people in with shiny advertising then they are in helping you with your weight issues. The Weight Watchers Mobile app for the iPhone helps with all of that. Not only will you find all the information here that you’ll need to get on the right track and stay on it, but there’s also tons of information that will help you learn about food – so you can learn how to love it, and still be healthy. This, and so much more is waiting in the Weight Watchers app for iPhone! 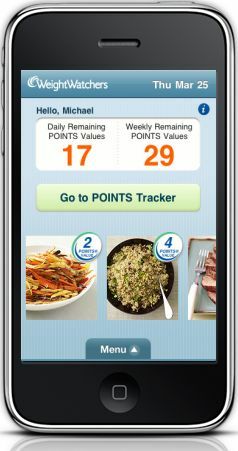 This weight watchers iphone app brings recipes right to your iPhone and will show a new one every day. Plus you can search for recipes and save as many as ten of them in your favorites. Then, the app will create a shopping list for you that will let you know exactly what you need to pick up in order to make your next meal a healthy one! Plus, there are also Cheat Sheets, which will give you alternate options when your healthy ones are few and far between. At Weight Watchers, they know that making good choices isn’t always easy. And so they want to help you in the easiest and best possible way they can! And, everyone needs a little support too. That’s why this app also has the time and location of the nearest Weight Watchers meeting. Just in case you’re suddenly in the need for the support a group of friends can be when you need it most! You’ll see inside the weight watchers app for ipad or iphone just how many people the app and Weight Watchers have both helped so far. You don’t even have to pay a lot of money to get this kind of help. This app is absolutely free and you can download it here.